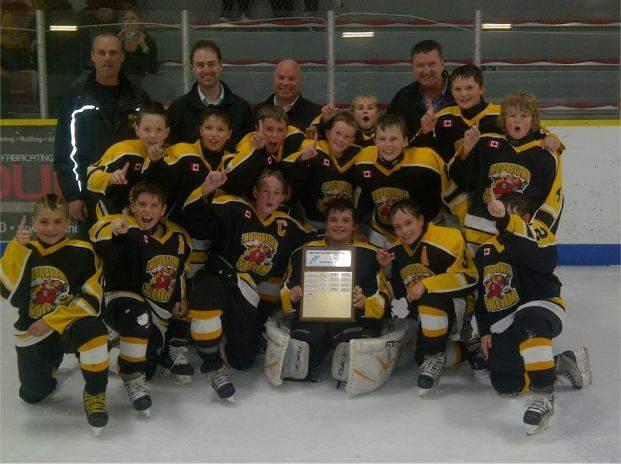 Atom Reps are 2011-12 Shamrock League Champions! The Atom Rep team capped off a successful season winning the Shamrock League Atom Rep Championship. The Storm finished 2nd overall, just behind the Petrolia Oilers, in the 22 team league in regular season play and then after a 3 round stay in the OMHA Playdowns joined the Shamrock League ‘A’ Playoffs. After sweeping the Belmont Rangers in the Semis the Storm faced off against the Oilers for the Championship. After 3 matchups during the season the teams were even with a 1-1-1 record with the Storm’s win coming in OT in the Silver Stick Semi-Finals. Starting on the road the Storm stole Game 1 of the Finals, tying it late and winning early in OT, 3-2. Game 2 saw the Storm take a 2-1 win at home setting up for Game 3 back in Petrolia. The Storm left little doubt that they were deserving Champions scoring 18 seconds in and then dominating for a 5-1 win and a 3 games to 0 series sweep. The Storm finished their 63 game season with a 40-17-6 record and a +80 goal differential. They won the Mooretown Tournament and were finalists in 3 others, one being the Regional ‘A’ Silver Stick which earned them an invite to experience the International Silver Stick Tournament in Sarnia. Atom AE Shamrock League Division B Champs! The Storm Atom AE would finish off their season as Shamrock League Division B Champions sweeping the St Thomas Stars, 3-0. 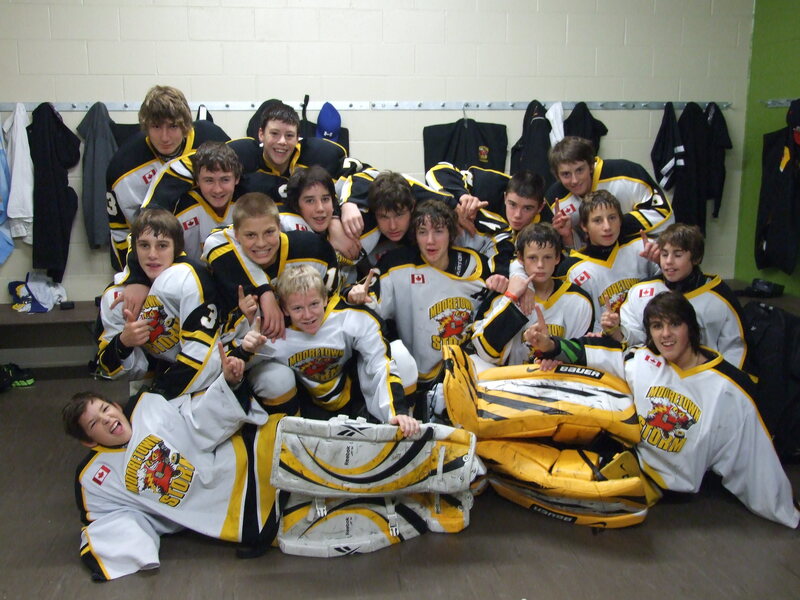 The boys would go undefeated winning all playoff games 12-0 against Wallaceburg, Bothwell, West Lorne, and St Thomas. In honour of the victory, Coach Weed would lose his locks to the delight of some of his players and parents. Cheers to a great season! Tri-County Update: Congratulations to the Mooretown #1 Atoms. 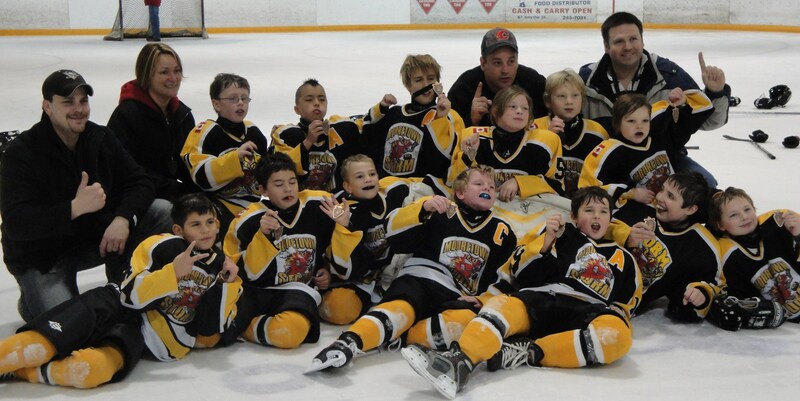 They are the Consolation Champions this year for the Atom division. 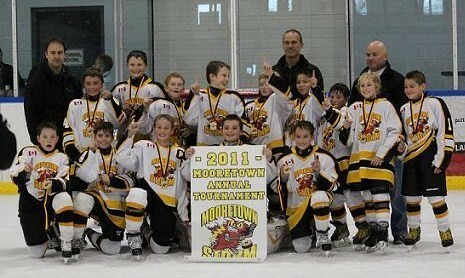 The Mooretown Storm Atom AE team played in the Alymer Tournament during the weekend of March 16-19th. They began the tournament on Friday night by beating Huntsville 3-1. The Storm then had to rise and shine early on the Saturday morning for a 7am game against Norwich that they lost 3-2. Mooretown would fall again against Simcoe 2-1 but had earned enough period and game points to be seeded fourth and have a rematch against top seeded Norwich in the semi-final. That game proved to be an exciting affair going to a double overtime thriller where the Storm potted the game winner to face off against Huntsville in the final. Although Mooretown gave what effort they could, the Sunday morning final would not turn out in favour of the AEs losing 4-3. Regardless, they were still the finalists and should be proud of their achievement. 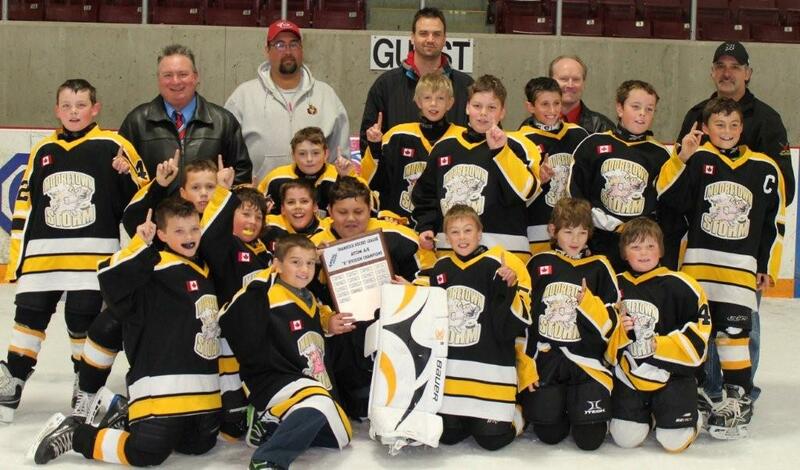 Mooretown Atom Tri County Team 1 captured the bronze medal after a thrilling 14 player shoot-out at the John Henry Memorial Tournament in Strathroy. Mooretown started the tournament with a 1 - 0 win over Lambton Shores to move themselves into the championship bracket, where they would face a determined team from Mitchell. With a powerplay goal to open the scoring for Mitchell, Mooretown just could not get one past the Mitchell goaltender and dropping the Storm to the bronze medal game after a 2 - 0 outcome. Mooretown would come into the game against the North Middlesex Jr. Stars with the intention of bringing medallions home. A very intense back and forth game seeing Mooretown take a 2 -1 lead after the 1st period, the players did not take no for an answer, even after the Jr. Stars tied the game in the 2nd, leading up to an amazing final. After the 3rd period chances, kept the fans on the edge of their seats, the teams had to play a 3 on 3 OT for 5 min. Shootout is needed and exactly what Spencer Johnson is ready for, after the first 5 initial shooters the score was 1 - 1 and sudden death shootout would continue. While the buzz was in the arena, and the noise coming from fans cheering and gasping at the close calls, on the 14th shooter Austin Kilbreath would score his 2nd goal in the shootout, and just as he turned around he got to see Spencer make his 13th save to seal the win for Mooretown. The Mooretown Storm Atom Rep team had a strong showing at the Alvinston Regional Silver Stick Tournament making it to the Championship Game in the ‘A’ Division. After an exciting overtime win in the Semi-Finals the Storm fell to North London Major A, coming home with the Finalists’ banner. It was the fourth consecutive tournament that the Storm reached the Finals. As a result of their 2nd place finish at the Regional Tournament and their strong overall record the Atom Reps received an invitation to be part of the 16 team field vying for the International Silver Stick Championship in Sarnia the weekend of January 20-22. The team will face the Port Huron Flags, San Jose Sharp Shooters and Sarnia Sting in their Round Robin games. Good Luck Storm! 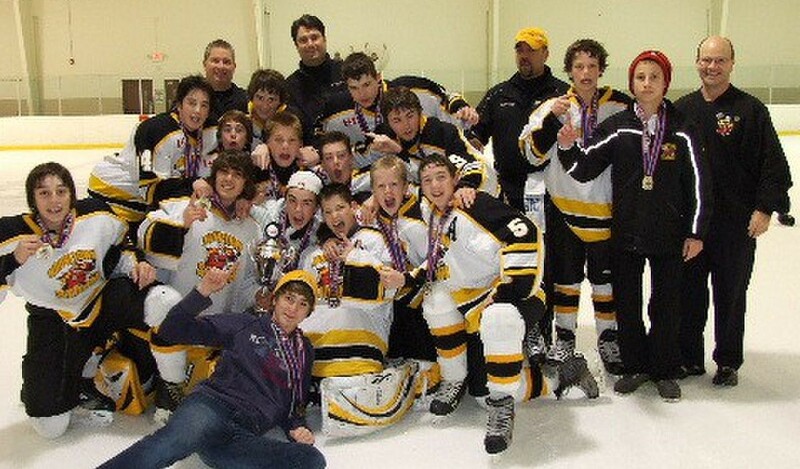 The Bantam Rep team won the A/AA division at the Motown Cup in Detroit Michigan on the weekend going undefeated in 4 games. In pool play, on Friday night, they beat West Mall Lightning 98 AA team 6-0 with Parker Gilhuly getting the hat trick and Kevin Ranger getting the shutout. On Saturday, Nolan Nicholson got the shutout in a 4-0 win over the North London Nationals 97 MD squad. On Sunday morning the boys beat the Thunder Bay Wrecks from Alpena Michigan 2-2. In the finals on Sunday afternoon with a short bench (2 out with injuries and 1 suspension) they beat Thunder Bay 3-2, scoring 3 power play goals in the last 3 minutes to win the championship with Blain Adams getting the winner. The Atoms Reps had a great weekend at their hometown tournament going undefeated to capture the Championship. After starting with a 3-3 tie against the Sarnia Major A team the Storm defeated Riverside Major A 3-0 and Simcoe 6-1. The Storm met up with Sarnia in the Finals and, in front of a full house, took the Championship Game by a score of 5-3. The St. Clair Bantam B team represented Mooretown at the 18th Annual Kitchener Fallfest Girls Hockey Tournament this past weekend November 11-13th. The team went undefeated in five games and only allowed 2 goals throughout the tournament to claim the title of Kitchener Fallfest - Bantam B 2011 Champions! Congratulations ! Bantam Rep Team Wins Schomberg Tournament! 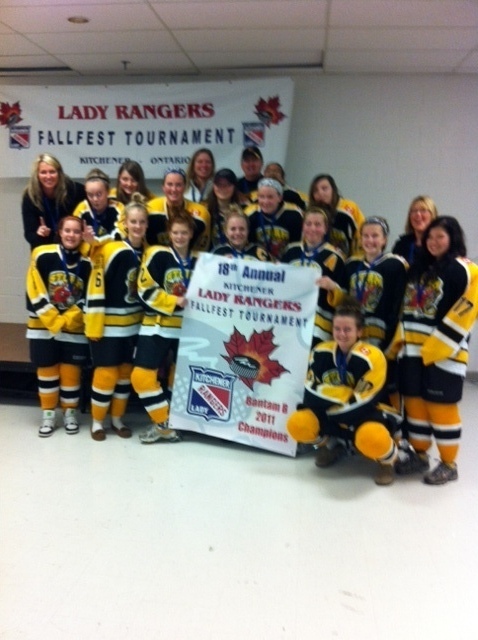 The Bantam Reps won the Schomberg tourney Oct 28-30th. Tied Ilderton 2-2, beat Lambton Shores 4-0 and then beat Ilderton in the finals 2-1 in a shootout. Parker Gilhuly scored the winner in the shootout and also took home the team MVP for the tourney.